We all want clean, healthy skin. We take care of our bodies, we eat well and try to get a good night’s sleep every night. We want to look and feel healthy whenever possible. Looking good on the outside helps us feel good on the inside. Sometimes, however, we have to deal with problem skin. We want to eliminate skin issues as soon as possible so that we can get back to looking and feeling healthy and attractive. Most common among teenagers, acne appears on our bodies when our pores become clogged or filled with dirt, oil or dead skin. Acne can be caused by many things, including some of the kinds of foods that we eat, stress and anxiety, smoking, hereditary conditions and so on. How to cure acne: There are a lot of over the counter products and remedies. Washing your face or other skin affected by acne on a regular basis also helps, as well as cutting down on or quitting smoking or eating less fat or greasy foods. Eczema is common among babies, although it can happen to anyone at any age. The telltale sign of eczema is dry, rough or irritated skin. This can happen because of food allergies or other bodily reactions caused by our immune system. How to cure eczema: Do not continue to scratch or itch the affected area, as that may only make things worse. Staying away from irritants such as wool clothing and avoiding strenuous activities that may cause your body to perspire more than normal can help. There are some soaps and topical remedies that help to ease the pain and itchiness. Rosacea is primarily concentrated on the face, but it has been known to appear in other areas of the body as well. It is characterized by red splotches around the face with some swelling at times. Although the exact cause of rosacea is unknown, thankfully it is usually only a temporary condition. How to cure rosacea: There are some doctor prescribed and over the counter medications available to cure rosacea. Surgical procedures are another option, although they can be a bit more expensive and time-consuming. 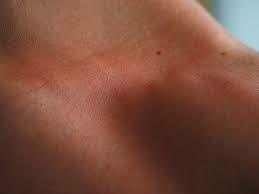 Skin tags are small patches of skin that appear as we grow older in areas of the body such as around the neck, arms or upper chest area. They are believed to form due to friction and can appear also due to hormonal changes or in people who are overweight. How to cure skin tags: Most experts recommend surgical treatment to remove skin tags, although they can be removed at home by tying a piece of string or dental floss around the affected area. Leave the string or floss on for a few days, and the tags should fall off by themselves. Vitiligo is a common occurrence nowadays. It happens when normal pigmentation in our bodies stops functioning correctly. This is often seen on the face or hands, although it can appear anywhere on the body. This can be caused by genetic issues with a person’s immune system, or by repeated exposure to certain harmful chemicals. How to cure vitiligo: While there is nothing that removes vitiligo completely from a body, there are some treatments such as phototherapy and ingesting some topical steroids that can help lessen its appearance. Some people resort to makeup as a temporary cover-up. Psoriasis is another common skin issue. This is caused by the rapid multiplication of skin cells. This extraordinary amount of skin cells can cause areas of red blotches on the skin, often with white scales or flakes. This can be extremely uncomfortable. It is usually caused by immune system problems or infection and can be easily triggered by stress or continued anxiety. How to cure psoriasis: There is a multitude of topical products available. Look for products that either contains retinoids or salicylic acid for best results. There are also some doctor-prescribed creams and ointments that can help reduce the pain and discomfort. Cold sores are another common and annoying skin issue, but they are usually very temporary. They are caused by abnormally high exposure to sun, high body temperatures, hormonal changes, and stress. How to cure cold sores: There are many different brands of cold sore remedies on the market today. Most of them are very effective at shrinking the cold sore and reducing the healing time in just a few days. These are just a few of some of the most common skin issues that people experience on a regular basis. Talk to your doctor, health care provider or dermatologist before taking products. Also, be sure to read the ingredient labels and review the possible side effects of any such medication. You want to heal the skin issue, but you don’t want to feel even worse in the process. Your skin is important, so take good care of it every day!